Well... I didn't intend this issue to be this late... life sure can get in the way of progress sometimes. We took our daughter to a concert this past weekend and I have spent the last few days making sure everything was ready for her to start school... 8th grade already... where has the time gone? for most people crocheting in the same place. I have been looking everywhere for an oblong pineapple tablecloth pattern.I need atleast 68x80". 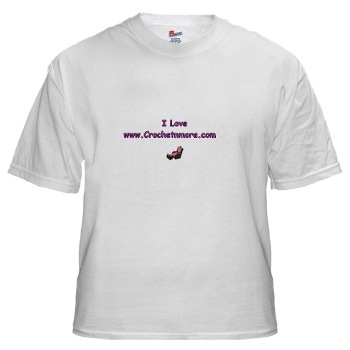 Or a smaller one that can be added on to. If anyone can help me it would sure be appreciated. SHOULD CEASE TO BE A MATTER OF CARE." Who was a valiant warrior, but the son of a harlot? yarn over, draw through both loops on the hook. Did you know that crochet terminology varies? Patterns designed in the United States and those designed the UK may seem the same but be careful! My question is about a pattern symbol. I'm working on a shawl and -what does a minus or dash- in front of a number mean in the pattern? Sc in 2nd chain from hook *ch 5, skip 4 ch, sc in next ch; repeat from * across- 9ch-5sps. It's the dash after across and before 9 - it's longer than the other dashes for instance ch-5 sps. I get everything up to that point where it says across-9 (but it's a long dash). What does that mean? Thanks - this is so nice of you to help. I really appreciate it. It means that you should have 9 places on that row when you finish where you made 5 chains. Designers do this to help you ensure you did the row/round correctly. If you have 9 ch-5 sps when you finish then move on to the next row/round. Hi there Lisa! I love your site and wanted to let you know that I am going to link a pattern of yours to Ravelry.com. Have you heard of Ravelry? It's a free knit/crochet community. You can list links to all of your patterns there. I love this site and wanted to share it with you. You can also make a project notebook, a yarn stash section and a queue of all the projects you are dreaming of doing. Anyway, just wanted to share. Hi! Just wanted to let you know - I love this pattern! I made a pair for my mom (she's 81 now) since she was using - of all things! - dishcloths I'd made for her as doilies! Then, of course, I had to make another "pair" since I had inadvertently skipped a row on one so that they were different sizes. But they both look lovely, in any case. And thanks to your patterns, and your site, I've stopped passing over thread patterns just because I can't see to work with thread any more. I just work them in yarn, although I sometimes give in and use sport-weight or other finer-weight yarns (rarely baby yarns, though; I'm just NOT a pastel kind of girl!). So, since NO ONE gets enough appreciation, here's mine to you. Thanks, and keep up the great work! P.S. I'd send a picture of the plate coasters I made Mom, but they’re packed for moving, and I didn't think to snap them before gifting. Thank you! P.P.S. By the way, this is NOT the only pattern I've made from your very extensive collection! And I've gotten some great ideas for my own stuff, too. Acrylic yarns can be safely used in the kitchen. It takes a temperature of around 500 degrees to melt it. I normally let my loaf pan cool before using the tote but I do have potholders and hotpads that I put pans on straight from the stove. Acrylic yarn does tend to stretch a little. 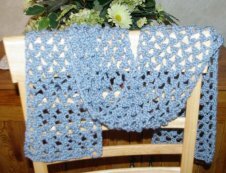 This pattern is worked using two strands of yarn at once which makes it a bit less stretchy. You can substitute a worsted weight cotton yarn if you like it better. I appreciate you asking permission to sell the finished product. 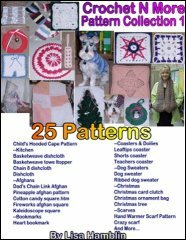 I allow items made using my patterns to be sold and or given as gifts. 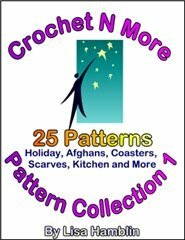 All I ask is my actual pattern not be sold and that you include the url to my site (www.crochetnmore.com) with items when possible. Thank you so much! Thank you so much. Hope the scarf pattern is working up well for you. What type of yo yo stitch pattern are you looking for? Individual yoyos that are joined or a pattern that looks like yoyos? I have been teaching myself to crochet, and I was so happy to find your easy dog sweater pattern. 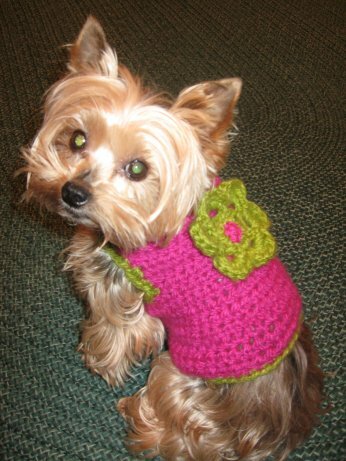 Thought you might like to see a pic of the sweater I made today for our Yorkie, Ruby. Hello, I have been patiently waiting the arrival of my rings to begin this dish towel and today my rings arrived. I am having difficulty with row #5 and I noticed that that line is in blue...am I missing something? I came back to your site to see if there were any notes that I may have missed but can not figure it out. I have quite a few unworked stitches in that row. I am only repeating the area between the [ ] once. My row 3 has 25 stitches as the pattern calls for. I am really sorry to have to bug you about this but I really want to make this dish towel to hang on my kitchen cabinets. I updated that page in 2004 with changes and Row 5 is highlighted to reflect new changes. I'm sorry I didn't note the actual stitch count for Row 4 and I don't have time to make another towel right now. I'm guessing the part causing you to have more stitches is the instruction in the brackets. When you Chain 1, work a double crochet between the next two stitches and chain 1 more... don't count the stitches on either side of that double when you go on. Now work a double crochet in the next 3 stitches... see if the stitches work out that way. Lisa, Number 12 should be removed. One site says short pieces of yarn and the other says 4"-8" pieces. Do you know of any website that discusses this topic? Any site that has comments from an avian vet? Hi, I am a beginner and I am working on my first real pattern. It is taking me just an hour to complete one round! Could you please tell me what the pattern means when it says: *1 dc in each dc to next ch-3 sp. (2 dc. Ch3. 2 dc) in next ch-3 sp. does this mean to dc until i get to the corner and at the hole in the corner is that where I am supposed to do the work in ( ) or is it done in the third dc that i do, i.e. 1 dc in each of the next 3 spaces, then work the ( )? >> *1 dc in each dc to next ch-3 sp. (2 dc. Ch3. 2 dc) in next ch-3 sp. This means you work one double crochet in each double crochet stitch on the round across to the next space where you made 3 chains. In the hole beneath the 3 chains you work two double crochets, 3 chains and two more double crochet stitches. Subject: work AROUND last stitch? I have a pattern that says "dc on next 3 sc, working around last 3 dc, work LDC in skipped sc...." What does it mean "work around"? Thank you. 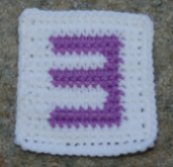 Work one double crochet in each of the next 3 single crochet stitches. Your next instruction is to work a LDC in the single crochet you skipped... and the part about "work around" means just that. 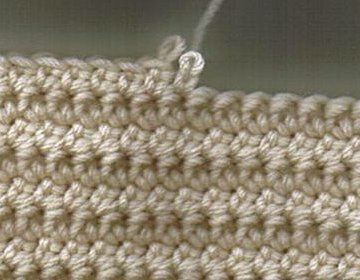 Access the single crochet stitch by working the LDC around the last 3 dc. It's like when you work a post stitch but you are going around more than one stitch. Does that make sense? How is the world did you get that tye dye effect that awesome sweater on your dashund duchess? That is simply beautiful! The dog's owner used a very colorful variegated yarn. A motorcycle patrolman was rushed to the hospital with an inflamed appendix. The doctors operated and advised him that all was well. However, the patrolman kept feeling something pulling at the hairs on his chest. Worried that it might be a second surgery the doctors hadn't told him about, he finally got enough energy to pull his hospital gown down enough so he could look at what was making him so uncomfortable. Taped firmly across his hairy chest were three wide strips of adhesive tape, the kind that doesn't come off easily. "Get well quick ..... from the nurse you gave a ticket to last week." A social worker who had recently transferred from the big city to the mountains was touring her new territory. She came upon the tiniest cabin she had ever seen. Intrigued, she knocked on the door. A child's voice answered, "Yep." "Pa? Nope, he left before Ma came in." "Well, is your Mother there?" "Nope, Ma left just before I got here." "Are you never together as a family?" "Sure, but not here. 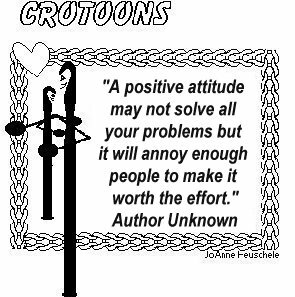 This is the outhouse!" I met someone getting on the elevator who was drinking coffee and complaining about how coffee made him nervous. I said why don't you quit drinking coffee. He said, "Because if I didn't have the shakes I wouldn't get any exercise at all." "Is there a senior citizen's discount?" A young woman who was worried about her habit of biting her fingernails down to the quick was advised by a friend to take up yoga to ease her nervousness. She did, and soon her fingernails were growing normally. One day her friend stopped her and noticing her long, groomed nails -- asked her if yoga had totally cured her nervousness. A guy goes to a girl's house for the first time and she shows him into the living room. She excuses herself to go to the kitchen to serve their coffee. As he's standing there alone, he notices a cute little vase on the mantel. He picks it up and as he's looking at it, she walks back in. He says, "What's this?" He turns beat red in horror and goes, "I'm so sorry, oh..I..." I was getting my hair cut at a neighborhood shop, and I asked the barber when would be the best time to bring in my two-year-old son for his first haircut. No car was to enter unless it had a special sticker on the windshield. A big Army car came up with a general seated in the back. The sentry said, "Halt, who goes there?" The sentry said, "Hold it! You really can't come through. I have orders to shoot if you try driving in without a sticker." The sentry walked up to the rear window and said, "General, I'm new at this. Do I shoot you or the the driver?" In a country home that seldom had guests, the young son was eager to help his mother after his father appeared with two dinner guests from the office. When the dinner was nearly over, the boy went to the kitchen and proudly carried in the first piece of apple pie, giving it to his father, who passed it to a guest. The boy came in with a second piece of pie and again watched his father give it to a guest. This was too much for the boy, who said, "It's no use, Dad. The pieces are all the same size." The doctor calmly replied, "Just wait until the autopsy, then you'll see that I was right." A young mother was standing outside a mall holding her six-month-old baby and her sister's three-month-old baby. Two elderly women approached the mother. "Are they twins?" one asked. "No, they're three months apart." "My! You sure had them close together."